The City of Compton’s Parks and Recreation Department has announced free community yoga classes for residents beginning July 2. The classes take place Saturdays at 9:30 a.m. at Burrell-MacDonald Park located at 2516 West Alondra Blvd. The classes will be taught by yoga instructor Alexandra Indaco-Heredia and are open to all ages and experience levels ranging from beginner to advance. Interested participants should bring water, a mat or towel, and wear loose clothing that will not restrict movement. The community yoga class is a part of Mayor Aja Brown’s Healthy Compton initiative, a community-based comprehensive approach to educating, empowering, and equipping Compton residents to lead healthier lives through the experience of healthy outcomes. 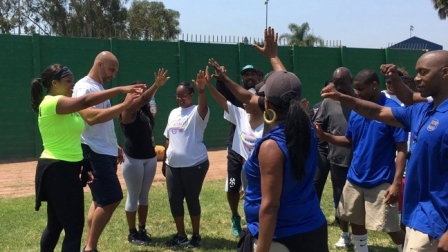 Mayor Brown, along with a host of health and wellness partners throughout the City of Compton and surrounding communities are focused on enabling residents to build healthy habits. The Initiative is a result of Mayor’s Brown’s leadership and a grassroots community effort with local residents, business owners and stakeholders working together over the past two years. For more information call (310) 638-6414.